After Independence in 1947, many of the erstwhile Political Prisoners visited the islands. 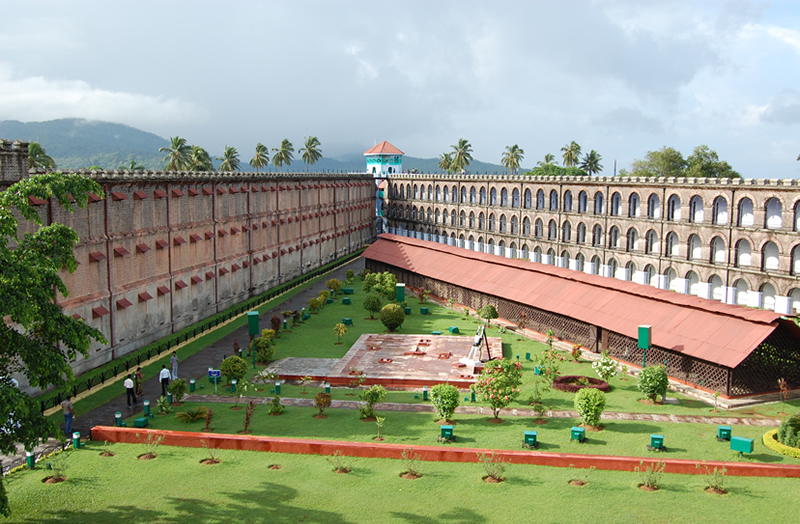 Their association-“Ex-Andaman Political Prisoner’s Fraternity Circle” took up issue with the Government of India, who accepting this proposal agreed to preserve it as National Memorial without making any substantial charge. 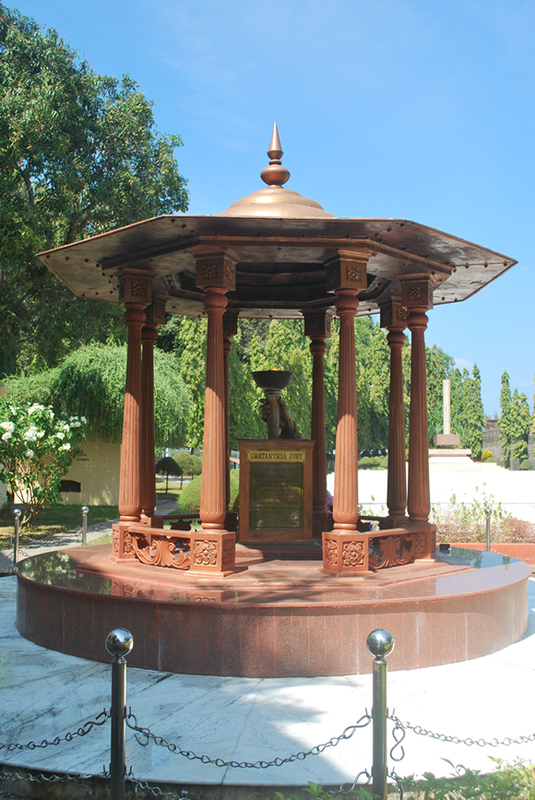 The Memorial was dedicated to the nation by the then Prime Minister of India on 11th February 1979. Today the entrance block of the National Memorial houses, Freedom Fighters Photo and Exhibition Gallery in the Ground Floor. The first floor of the building has an Art Gallery, Netaji Gallery and a Library on Freedom Movement. Gallery on First War of Independence and on Old Photographs Gallery have also been set up in the premises of the National Memorial. 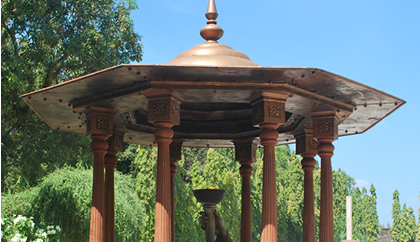 An eternal flame of Freedom-Swatantrya Jyot has been erected in the vicinity of the Cellular Jail in memory of all freedom fighters and martyrs. The idea of establishing a Penal Settlement in these islands was germinated in the minds of the British Rulers in 1857, to deal effectively with those who revolted against their paramount power during India’s First War of Independence. A committee of experts consisting of Dr. F. J. Mouat, Dr. G. R. Play fair and Lt. J.S. Heatcote visited the islands for a survey on 8th December 1857 and submitted a report to the Government of India on 15th January 1858 and the Union Jack was hoisted on 22nd January 1858 by Capt. H.Man the Executive Engineer, who was deputed to take formal possession of the islands. Thus the Penal Settlement stared with clearing operation on the small islands of Chatham, only to be abandoned due to scarcity of fresh water. The site was then shifted to Ross Islands. The first batch of 200 freedom Fighters arrived in the island on 10th March 1858 aboard the frigate “Semiraimis”, under the overall charge of Dr. J.P. Walker who was assisted in his task by a guard of 6o naval brigademen, two native overseers, subsequently; the prisoners were also transported by three more ships-Roman Empire (171), Dalhousie (140), and Edward (130). The task of cutting and clearing the jungle was given to the Political Prisoners, most of them belonged to wealthy and professional families-Zamindars, Nawabs, Writers and Poets, among others. The hardships and toil, which they were put to, were severe and often quite unbearable. The British Government always viewed ways of these freedom fighters with fear and suspicion and had no intention to ever allow them to go back to the mainland. The prisoners were initially kept in the open enclosures and were paid one anna and nine pies per day, as a subsistence allowance. The allowance was to cover their expenses for food, clothing and so on. Viper Island was selected as the place where members of Chaingangs (the convicts being chained together and confined at night) were put on the hardest labour. A jail and a gallow were constructed in the Viper Island. Though the First war of Independence was quelled, the everlasting flame for achieving freedom could not be put out. Freedom Fighters taking part in Ahab movement, participants of Manipur Revolt and a large number of Burmese from Tharawadda, who had revolted against British rule, were also transported to the Penal Settlement in the Andaman. As the time passed and the settlement grew in size, the Authorities found it difficult to enforce strict discipline. Safe custody of freedom fighter became a great problem. It was therefore decided to construct a jail. 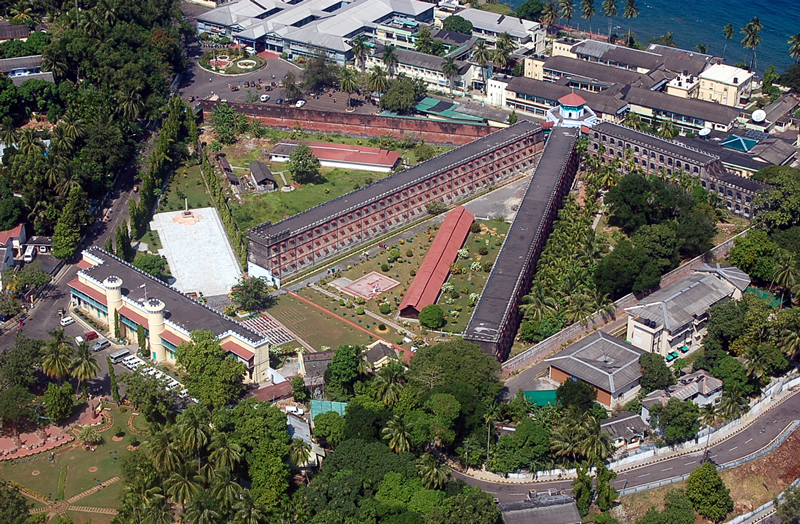 A two-member committee headed by Sir Charles J.Lyall and Sir A.S.Lethbridge visited Port Blair in 1890 and recommended the construction of jail building in Port Blair. 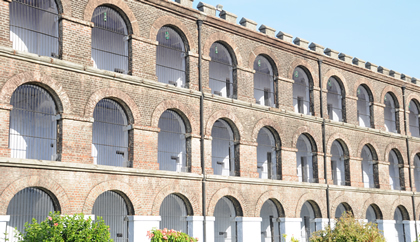 The construction of Cellular Jail building started in 1896 by the settlement order No. 423 dated 13th September 1893. It was completed in 1906. Spread as seven spokes of a bicycle wheel, this unique three-storied structure was the first of its kind in India.663 cells in the jail were specially built for solitary confinement of the prisoners. Later 30 additional cells were also built. 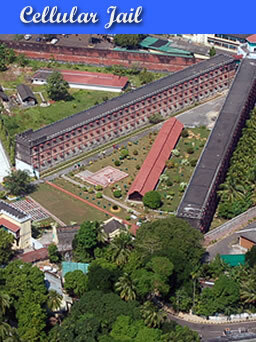 In the center of the seven wings of the Cellular Jail was built the Central Tower. Each cell of the Wing was sealed off by an iron grill door. Thus a single guard on duty could supervise all the seven wings from his vantage position. Another unique feature of jail was the total absence of communication between prisoners in the different wings since the front of one row of cells faced the back of the wings in front. Each cell measured 13.5 ft.by 7 ft. and had an iron grill door. A 3ft .by 1 ft. ventilator, 9ft. from the floor provided some light and air. The cells in the jail were in a row. 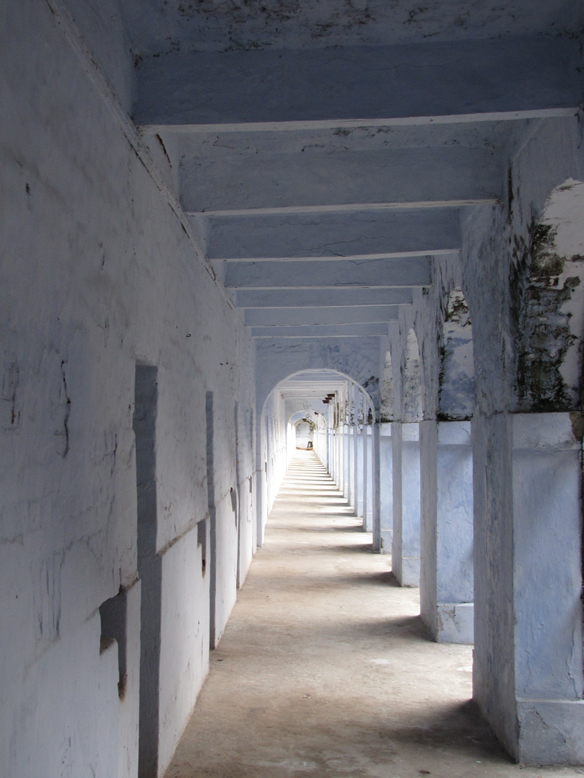 The verandah about 4 ft.wide which ran all along the front was sealed by iron railing fixed into the arched pillars that supported the roof of the verandah. 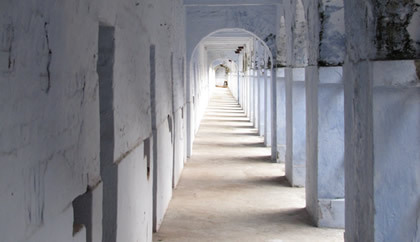 All the seven corridors culminated at the Central Tower fixed by an iron gate to central entrance and exit. The cells were secured with iron bolt and lock from outside in a manner, which made impossible for the prisoners to unlock it, no matter however they tried. Each of three storey's of the seven wings had wardens for night watch.21 wardens simultaneously manned the watch duty and vigil throughout the day and night. Besides, sentries in the Central Tower also kept watch. To accelerate construction work, about 600 convicts from different stations like Viper, Navy Bay, Phoenix Bay, Birchgunj and Dundas Point etc, were engaged. About 20,000 cubic feet of local broken stone was used, while building materials were also brought in from Burma. Some 30,00,000 bricks made in Dundas Point and Navy Bay Brick kilns were used to Construct the jail. A two-storied building at left side near the entrance of the jail was also constructed to be used as jail hospital. On the plinth of this building now stand Martyrs’ Column. Near the compound wall at right of the main entrance were the gallows, capable of hanging three persons simultaneously with a separate door in the outer compound wall to carry out corpses. Adjacent to the gallows were kitchens with Hindu and Muslim sections. A well was dug in the yard between two sections for the supply of sweet water. At the main entrance of the jail stands the two-storied Administration Block. The jail was manned by the Jailor and Deputy Jailor, assisted by petty officials called Tendals, Jamadar, Warder and Petty Officers, who used to be incharge of the convicts. Powers of Superintendent of Jail were vested in the Chief Commissioner, but later these were delegated to the Senior Medical Officer. Many charismatic personalities were imprisoned in this Jail. Savarkar brothers, Motilal Verma, Babu Ram Hari, Pandit Permanand, Ladha Ram, Ullaskar Dutt, Barin Kumar Ghosh, Bhai Parmanand, Indu Bhushan Roy, Prithvi Singh Azad, Pulin Das, Trailokyanath Chakravarthy, Gurumukh Singh, among others. The catalogue is long and distinguished. 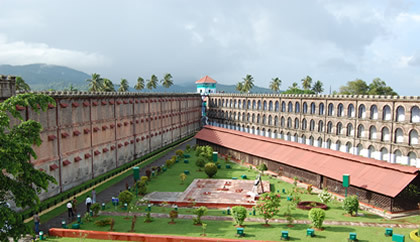 Group of revolutionaries involved in Alipore Bomb case, Nasik Conspiracy Case, Lahore Conspiracy Case, Chittagong Armoury Raid case, Inter-Provincial Conspiracy Case, Gaya Conspiracy Case etc were brought to the Cellular Jail with long terms of imprisonment. These men and women so convinced of their nation’s destiny and so willing to give the utmost of themselves found themselves confronted with the cruel Jailor, David Barrie, an Irishman who believed that it was his God-given destiny to scourge these enemies of Her Majesty- the Queen with violence and vile abuse. The work quotas given to the Political Prisoners were frequently impossible to complete within specified time and the dire punishment followed for those who failed to meet them. Punishment was barbaric. Torture and flogging were frequently resorted to on iron triangular frame, gunny bag uniforms, unhygienic diet, bar fetters, crossbar fetters and neck ring shackles and leg iron and chains were other deterrents for those who refused to submit to the brutal wardens. The punishment varied from handcuffs for a week and fetters for six months to solitary confinement. 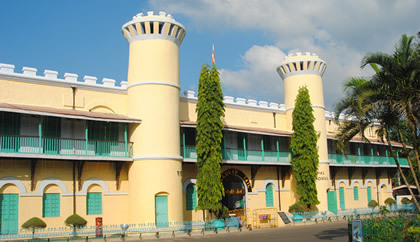 The freedom fighters brought to the Cellular Jail rebelled against the tyranny of David Barrie. Mass hunger strikes were resorted to especially between 1937 and 1938. Three persons died. The last strike began in July 1937 continued for 45 days. The strike was terminated on the intervention of Mahatma Gandhi and Rabindra Nath Tagore. The Government decided to close down Penal Settlement and all the Political Prisoners of Cellular Jail were repatriated to the jails in their respective states on mainland India by January 1938. The Japanese occupied the Andaman and Nicobar Islands during World War II from 23rd March 1942 to 7th October 1945. They put to death many hundreds of people in the most barbaric way, whenever anyone was suspected of sympathizing with the British. 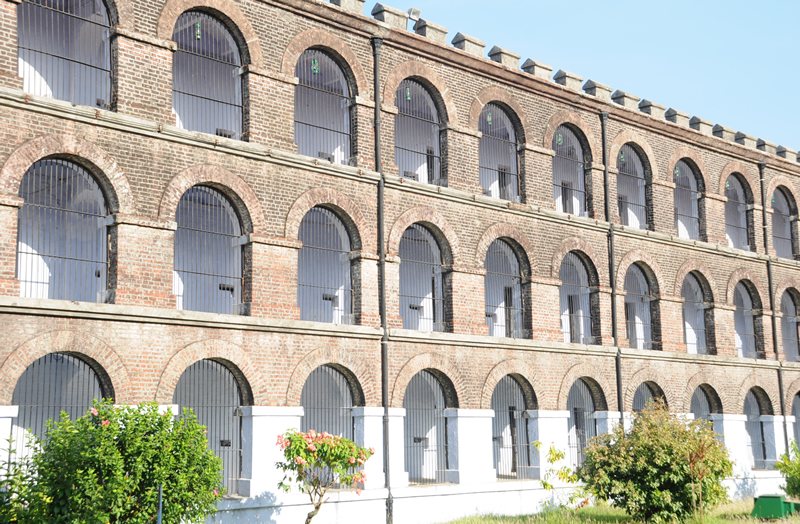 Many of the educated persons who were rounded up as suspected spies were kept in the Cellular Jail and were later shot dead. Many were buried in a common grave. The Humfraygunj Martyrs Memorial today stands as a mute witness to the inhuman treatment meted out to the citizens of Andamans. Netaji Subhash Chandra Bose visited the islands as Head of the Provisional Government of India on 29th December 1943. 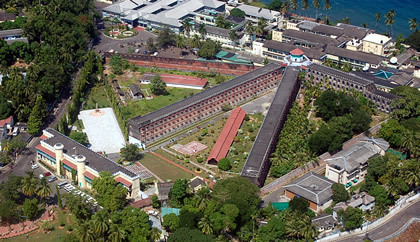 During his three days on the islands, he visited the Cellular Jail and stopped the punishment of prisoners without proper trial. Netaji hoisted the tricolour flag of India at Andaman for the first time and christened the Andaman and Nicobar Islands as “Swaraj” and “Shaheed” Dweep respectively.